Want to play rugby in London? Then scrum on down. DUNCAN MILLS gives the low-down on three clubs catering to all skill levels in the Kiwi rugby fraternity. 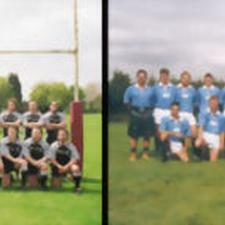 Members of the London New Zealand Rugby Club at the end of last season, Members of the London Kiwis rugby club at its ground in Chiswick. Just got off the plane and wondering what all the fuss is about that little round ball being kicked by those overpaid stars in the soccer Premiership – surely an oval ball would be much better? London New Zealand Rugby Football Club (LNZRFC) With a proud history stretching back to the club’s foundation in 1926, LNZRFC exists to provide visitors to London – mostly, but not exclusively, young New Zealanders – with the opportunity to play rugby. "Most have played provincial rugby through the age groups at home but the club takes on guys of all standards," Campbell Rowe, a LNZRFC committee member, says. The club is based at the Birkbeck Sports Ground in Greenford, West London, and fields two teams. The 1st XV plays in Division 4 of the England RFU Powergen London League and the 2nd XV plays in Division 3 of the Middlesex County Merit Table. With a squad of around 45 for the two teams, they have done well pre-season games, winning all their friendlies and are now looking forward to the coming season, Rowe said. "But the club is not just about rugby as we have a very active social scene. We have a great family and community atmosphere," he said. Club membership costs £60 for the season and includes transportation to all away games and a club dress shirt, worth £20. The club also has a number of social members. For more information call Campbell Rowe on 07971 177 116, or visit the club’s website: www.lnzrugby.co.uk. Kilburn Cosmos Another young club, the Cosmos, was founded in 1996. It began with a guy standing beside a tube platform handing out flyers but now, eight years on, they are growing in strength. They have had players from all over the world – Germany, Hungary, Ireland, Scotland, Wales and even a few token Englishmen. They remain, however, very much an Antipodean club and, at present, are predominantly made up with Kiwis. "We have two sides and play our home matches in the Hackney Marshes," team spokesman David Barker said. "We’re also looking to set up a ladies team." "Our 1st XV plays in the Hertfordshire/Middlesex division 2, having been promoted at the end of last season, while the 2nd XV plays in division 4," he said. Matches are played on Saturdays with a strong emphasis on the social side of the sport. Membership costs £25 for the season and £5 per game thereafter. "We’d like anybody to come along, the main thing is that people enjoy themselves. We want to win, but we play to enjoy." For more information about the Kilburn Cosmos call David Barker on 07773 350 307 or email [email protected] Any ladies interested in playing should contact Karen Aikinhead on 07832 214 722.